I want to try backpacking in the Catskills. But I want to be sure that at the destination there is a designated campsite or at least a legal campsite that can fit a tent. 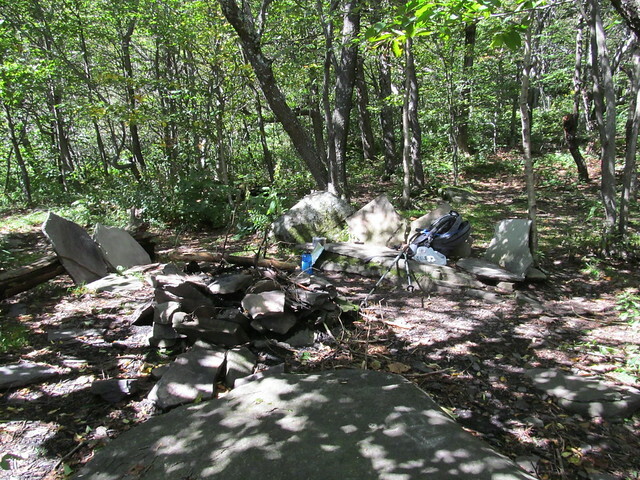 I know about the designated campsites at Giant Ledge and in the col between Slide and Cornell. Are there other places where I can reasonably be sure of having a place to put my small (2 person) tent down? Water is not an issue as I carry everything that I need. 1. You can camp any place where you are 150' from a trail, road, or water source (pond or stream). 2. You must camp below 3500' between March 21 and December 21), except in an emergency. 3. There are quite a few lean-to's in the Catskills. They are available on a first-come first-serve basis, and you must share with others. If you have a mountain in mind, some of us can make some suggestions. Most of the lean-tos have posted tent sites nearby, if for any reason you dislike lean-tos. (There are many reasons to dislike them, but that's a topic for another time.) And, as Mike says, there are a lot of lean-tos. If you're down low enough that you're in deciduous forest, it's usually not horrible to find a stealth tent site in spring and fall. In the summer, the growth of nettle, blackberry and viburnum can make it nearly impossible to find a spot that isn't covered with dense (and stingy and scratchy) brush. Get the deck of trail maps from NY/NJ Trail Conference. There are a lot of good sites marked on them. There are some really nice sites, too, that aren't on the maps. One (if you don't mind a dry camp) is that in Jimmy Dolan Notch, there's an unmarked herd path directly opposite the access trail (at the junction with the Devil's Path). It goes to a spectacular overlook over the notch. Watch your step: the trail just abruptly ends at a cliff edge. On the way to the overlook, the path goes through a really nice site with stone chairs and a fire ring. It's obviously heavily used, it's more than 150 feet from a marked trail, and nobody's posted a NO CAMPING disk. I've heard tell that Pecoy Notch has a similar site, but I've never found it. There are a few nice official sites near the start of the Fishermen's Path, where it heads up the Neversink away from the Peelamoose-Table Trail. I've slept there before. The new Long Path extension over Cross Mountain and Romer also has some designated sites. There's one that's nearly due east of Wittenberg with a very nice view of Ticetonyk across the Esopus valley. But really, let us know where you're thinking of going. Almost anywhere in the Catskills that makes a decent backpack has no shortage of places to sleep.